Think only humans use highways? Not so! Animals also have paths on land, in the ocean and in the air that they follow year after year. Not unlike our daily commutes, during migration birds use known routes. 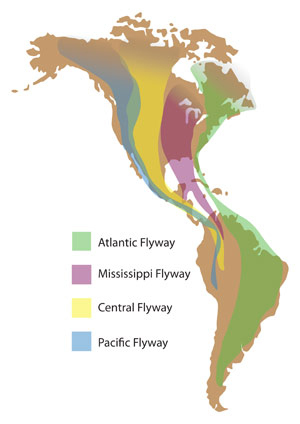 In North America, for example, there are 4 main migratory superhighways generally followed by birds: Atlantic, Mississippi, Central and Pacific flyways. Depending on where the birds are going as their final destination in North America, and where they are coming from, they will generally follow one of these main routes which follow food sources and have habitats along the way to rest and bulk up. The Central and Pacific flyways converge in Central America over land. The Mississippi and Atlantic flyways have portions over open water, while some of the flight is over land. Most birds need to be able to stop over land to refresh themselves, although there are some long distance migrators w ho can fly for days without stopping and do so over large bodies of water — an amazing phenomenon we will discuss next month. Atlantic Flyway: : Bald eagle, American woodcock, Wood thrush, Snowy plover, Grasshopper sparrow, Fox sparrow, Louisiana waterthrush, Black-crowned night heron. Mississippi Flyway: Many warblers, including Connecticut warbler, Yellow warbler, Blackburnian warbler, Wilson’s warbler, Bay breasted warbler, Nashville warbler, Cerulean warbler. Central Flyway: Sandhill crane, Ruby throated hummingbird and many duck species. When can you expect to see these birds flying through? If you live along the Atlantic flyway, here’s an interesting resource to find out when birds arrive in eastern states. If you live along any flyway, look up! You may be able to see migration going on any time of year. Extreme Migrators: How Do They Do It?